Buckle up, today we’ll install the Power BI Desktop application. Next we’ll connect with our first data sources, Excel and an OData feed. And lastly we’ll create our first report. We’ll take Power BI for a free test drive without creating an account or subscribing to a service. This is made possible by the free Power BI Desktop application, a 57mb download. 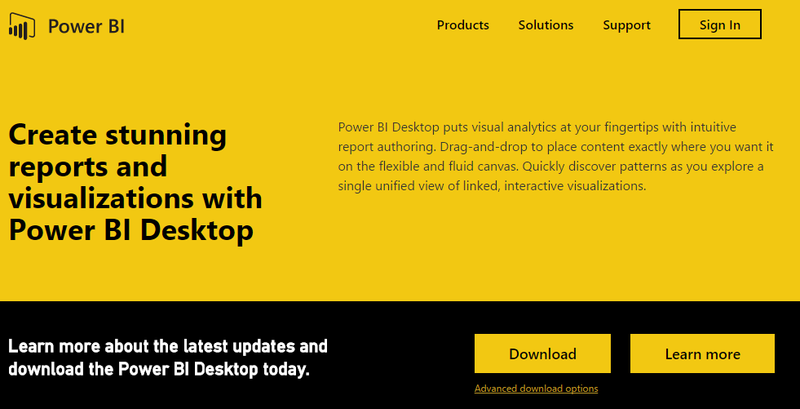 Visit the site, scroll down to the end of the page and go to the download page by clicking on the link “Power BI Desktop” as highlighted in below picture. This will take you to the download page where you can now click the download button and start your installation. 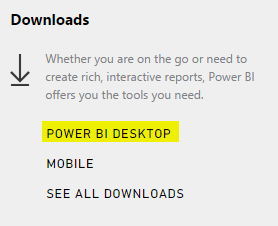 Open the Power BI Desktop application after the installation finishes. The first time we run the Power BI Desktop application we’ll be greeted with the following, very yellow, screen. Don’t dismiss this screen yet! It might seem like one of those useless screens you never want to see. But let me explain to you why this is such a great screen to receive. There are a couple of important things to notice on this start page! As seen in the first part of this series. This is the perfect place to ask any Power BI related questions. Microsoft people and of course experts in the community will help you out! If you’re interested in keeping up to date with everything the Power BI team is doing, bookmark this link. The 3 tutorials listed here are perfect for your first encounter if you don’t have your own data source readily available. They provide you all the required data and they’ll guide you through some of the basic functionality as well! Those tutorials on the startup screen are an important start to get our first experience with the possibilities of Power BI. There’s no sense in creating a basic tutorial if Microsoft has already created it for us. I suggest you follow at least one of these and we’ll see each other at day 3 of this series! Even more Power Query experience! Want to check the end result and play around with it instead? Download the Power BI dashboard here! Even more Power Query basics! Got questions, remarks or just want to discuss this blog? You can share this on Twitter, LinkedIn and Facebook using below buttons.